Blue Dream is a popular Hybrid marijuana strain often used for depression and stress. Blue Dream will make marijuana enthusiasts feel happy, relaxed and social. Blue Dream is the world’s most popular legal cannabis strain. 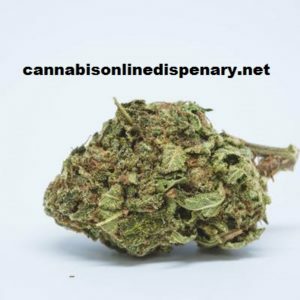 It’s high-yielding, fairly fast to grow, and has a wealth of medical benefits. This well-balanced Hybrid has two dominant phenotypes, giving certain varieties a more cerebral or body-heavy effect. This herb is the most popular strain of cannabis around. A top-seller in the West, this slightly Sativa-dominant hybrid comes from California. Let’s be honest; it’s difficult to find a hybrid as perfect as this strain. This strain is strong, with a THC content that ranges from 17 to 24%. 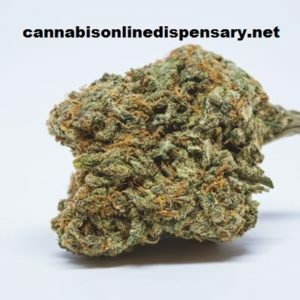 While potent, it’s well-balanced, providing a nice cerebral high with just the right amount of Indica body relaxation. As far as genetics go, this strain is a happy cross between Blueberry and Haze. Such an esteemed lineage gives this strain a sweet yet slightly sour aroma. The sweet aroma of berries will remind marijuana enthusiasts of this flower’s parent plant, and is almost reminiscent of blueberry pie with its subtle hints of vanilla. Flavor-wise, cannabis consumers can expect the same sugary taste of blueberry to will linger on the palette. This strain can cause some heavy coughing in relative newbies, but experienced marijuana fans will enjoy the combo of flavors and aromas to no end. Marijuana connoisseurs are sure to notice that, despite its Blueberry lineage, very few plants show blue or purple hues. Also of note are the clear colored trichomes, meaning nugs won’t sparkle like some others. Cannabis consumers shouldn’t be alarmed, however, this strain is seriously sticky and tough to break up. You don’t become the world’s most beloved strain by only appealing to recreational consumers. Blue Dream is adored by many medical marijuana consumers thanks to its bevy of therapeutic benefits.